The Kings of the Desert are back from the dead... and they're pissed. Send your adventurers out on what should have been a simple mission to retrieve a vbit of mineral oil and find out what happened to a couple of friends... That "simple mission" turns out to be an intriguing adventure where they will confront the desert kings of old and their goblin and ogre minions. 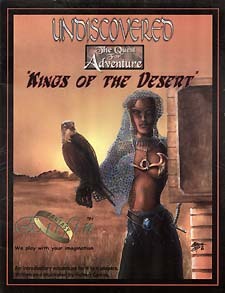 An adventure the Masters of the Academy hought they were finished with some thirty years ago, but has now come back to haunt them and the prosperous trage city of the desert, Vad Khara.